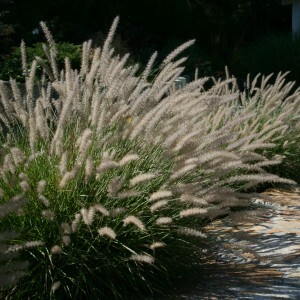 When it comes to pruning ornamental grasses, even an ordinarily confident gardener can feel some confusion. Each type of grass has different requirements, which makes it hard because there’s not one rule of thumb which fits all. While some varieties look shaggy and sad if not whacked to the ground each January, for other types of grass this treatment sounds the death knell. Not to worry. 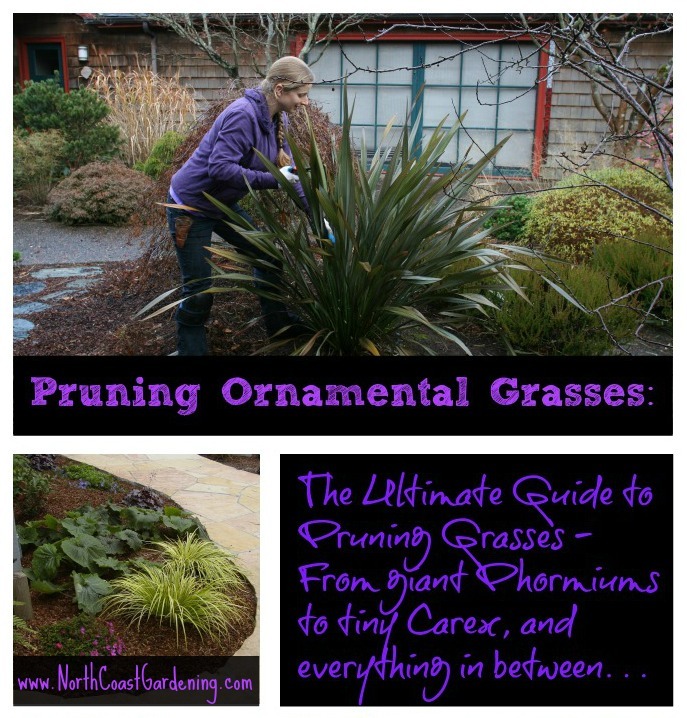 I’ve got you covered with a list of the ornamental grass varieties that are grown most commonly, and simple instructions for how to prune each. Though I live in the coastal Pacific Northwest and have geared my instructions towards people in similarly rainy climes, the only thing that would be different in a climate where it snows is that you would have to prune your grasses either earlier before the first snow, or later in midspring. In cold climates, I’d advise pruning grasses as late as possible, since snow-covered ornamental grasses make a sculptural display in the landscape, and by allowing the seeds to sit on the plant, you provide birds with an important food source through a tough time of the year. Ready to prune your grasses? For ease of reference, I’ll start with the largest varieties and work my way down to the smallest. Flax (Phormium) and clumping varieties of festival grass (Cordyline). This is one of the toughest plants for people to wrap their minds around pruning, because their bold colors and spiky nature make them an instant focal point in the garden. So the penalty for doing it wrong is staring at a very ugly plant for some time. Luckily, pruning these plants isn’t difficult, just a little time-consuming. You can approach them in one of two ways. Keep them looking nice by using your hand pruners to individually remove any blades that are brown, have been damaged by snails, or are old and have lost the vibrant color of their new growth (on flax). Simply put on some eye protection, then cut each blade as far down into the base of the plant as possible. You can also control size in this way, by spending a peaceful half hour removing the tallest blades one at the time. The second method is to ignore them until they are unattractive and oversized, and every few years whack them to the ground. Once they come back, you’ll have a honeymoon period of about six months when they look flawless and colorful again, and then you will start wishing you had the patience to cut out the unattractive individual stalks to keep them looking nice. Cape rush (Chondropetalum), Papyrus (Papyrus) and rush (Juncus). Restios and rushes are gorgeous in the landscape because they have an upright habit and deep green foliage which looks good year-round. However, it’s best to put them in a location where they are going to be happy and will have room to spread out, because they resent being pruned and can take over a year to even begin to look okay again after being attacked by the hedger. If there is a buildup of brown strands, cut them out individually as low to the ground as you possibly can. A healthy plant should have very few leaves that aren’t green. Maiden grass (Miscanthus), feather reed grass (Calamagrostis), Giant pheasant’s tail grass (Stipa gigantea). Maiden grass and ot her large grasses that go fully dormant actually benefit from and appreciate being pruned down to about 10 inches tall each January. Start by putting on some gloves and long sleeves to prevent cuts, then tie the grass into a bundle with a spare bit of rope, lay a tarp next to the plant, and use your powered or handheld hedging shears to give them a quick buzz cut. The one thing you should never do is prune off just the tops and flowers in fall, as I see so many overzealous lawn care companies do. That takes away the loose, airy beauty of the fall and winter flower display and does nothing to address the buildup of old foliage within the plant. New Zealand wind grass (Anemanthele lessoniana). This evergreen, or shall I say ever-orange plant is absolutely stunning when it’s happy – but wind, heavy soils, and simple time can cause a buildup of beigey-brown leaves that make your plant look sorrowful and half dead. Unfortunately, New Zealand wind grass does not respond well to being pruned to the ground, and if it comes back at all from such a treatment, it will do so quite slowly. Another alternative is to grab small fistfuls of primarily dead leaves and cut them out as close to the base as possible. This stimulates new growth, and by moving around the plant and pruning out about 20 fistfuls of dead leaves every two months for a year, you will effectively rejuvenate the plant and give it new life. Switch grass (Panicum) and fountain grass (Pennisetum). These grasses are satisfyingly easy. Use your handheld hedging shears or a Japanese trimming sickle and cut these plants about 5 inches from the ground in January. The one exception are colored fountain grasses such as ‘Rubra’, ‘Fireworks’, or ‘Cherry Sparkler’, none of which appreciate our winter frost and rain. I generally treat them as annuals, but if you are hoping to overwinter them, leave them alone until you can see whether or not they are coming back in spring, because the old foliage will shelter the growth points and help them through any frosty nights. Once you see new shoots sprouting up at the very base, you can cut out the old foliage, being careful not to remove any new growth with it. 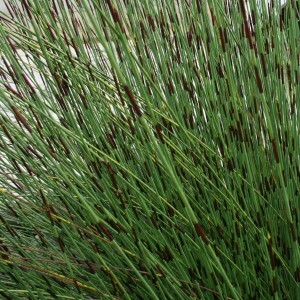 Mexican feather grass (Nassella tenuissima). These grasses don’t need to be pruned every year, but when they do need it they can be pruned at any time of year you wish. When they are ready, they will develop shaggy beige dreadlocks which rival that of a Humboldt hippie, and may begin to flop. I generally end up pruning them every two years in August after bloom. Wear sturdy jeans, and a workshirt that the seed heads won’t cling to, because (trust me on this) the seed heads do not come out easily in the laundry and the incautious gardener will be picking itchy seeds out of their soft fleece for months. Japanese forest grass (Hakonechloa) and Japanese blood grass (Imperata cylindrica). This is another easy set of grasses. You can prune them at any time between when they go fully brown in November, and when their new growth begins to emerge in March. Just use your handheld hedging shears or pruning sickle to bring them down to about 2-3 inches tall, just as you would a dormant perennial flower. Blue oat grass (Helictotrichon). 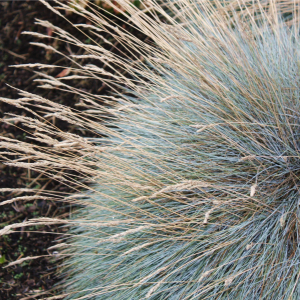 While I love the spiky habit and strong blue color, blue oat grass piles up so quickly with dead beige strands that it quickly overwhelms the look of the plant. Here’s my quick solution for getting them back on track: put on rubber gloves, and run your fingers through the grass as though you were combing its hair. The spent foliage comes out in easy clumps. You may need to do this quarterly to keep the plant looking good. However, this plant doesn’t respond well to being pruned to the ground, and may rot out in clumps if you whack it frequently. Sedge (Carex), lily turf (Liriope) and mondo grass (Ophiopogon). These plants really don’t need to be pruned much at all, and can look good indefinitely without anything more than occasional deadheading (for Liriope). However, if painters or the family dog tramples your plants, or if time causes some browning of the foliage, you may need to go in for the big chop. In early to midspring, use your hand pruners or hedgers to remove two thirds of the foliage. Though your plants will look awkward at first, they should look good again within 2 to 3 months. However, because this type of pruning weakens evergreen grasses, it shouldn’t be done any more often than is necessary to keep them looking good. Sweet flag (Acorus). This plant is very similar to sedge, lily turf, and mondo grass in the way it is pruned, yet there is one important difference. Sweet flag tends to spread out laterally and cover the ground in a wide, tight clump of very thick rhizomes. If you would like to make the plant into a smaller clump, you can grasp a handful of foliage around the outer edge of the clump and pull towards the center of the plant. The most recently rooted rhizomes will pull up easily and it’s a simple matter to cut off any of those outer rhizomes by snipping them off as close to the base of the plant as possible. 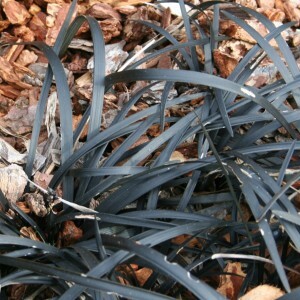 If you go all the way around the plant, lifting the outer edges of the clump and trimming out each rhizome, you can effectively make the plant much smaller around, and an added benefit is that you will have a small pile of lightly-rooted sweet flag to plant around the garden or give to friends. This can be done at any time of year. Blue fescue (Festuca ovina var. glauca, more). I think of blue fescues as short-lived, because they eventually pile up with a great deal of dead foliage if they aren’t pruned and divided every few years. While I certainly don’t object to a spot of pruning, I find division tiresome, both because of all the digging and because of the uncertainty about whether your newly divided plants will make it. However, if you don’t want to replace your fescues every 5 to 7 years, consider getting on a schedule of pruning every other year by removing half to two thirds of the foliage in midspring, and dividing every 3 to 4 years. While selective pruning is always done with hand pruners, cutting grasses to the ground is a different matter because of the sheer number of stems you need to trim all at once. Even with small grasses such as Japanese forest grass or Mexican feather grass, using hand pruners requires so many cuts that it makes this fun seasonal task seem like an arduous chore. Here are my favorite tools to get the job done right. 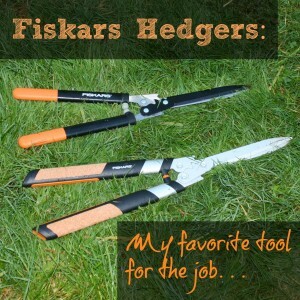 Fiskars PowerGear Hedge Shears, or Fiskars Quantum Hedge Shears. Hedging shears are an ideal tool for cutting large and small grasses down to the ground. Though most hedge shears are designed to do a precise job of cutting tiny leaves and stems, such as those of boxwood, these particular models are built for heavy-duty jobs where you’re cutting thicker stems. This line of shears from Fiskars have a gearing mechanism which provides leverage to help you power through cuts, and the blades have a nonstick coating so they slice through even the largest ornamental grasses with ease. The Powergear version is the regular workaday version, while the Quantum model is the high-end one that does essentially the same thing but feels much more luxurious to use. 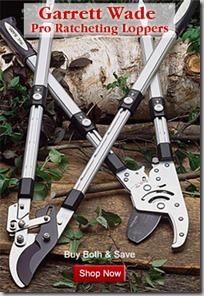 Battery-powered hedging shears. While you may have tried some battery-operated power tools in the past and found them lacking, there’s a new generation of 40 V cordless power tools which are quiet to run, avoid the mess of gas and oil, and work great for about an hour on each charge. This 24 inch one from Black & Decker is the model that my landscaping crew uses on our jobs (spare batteries here ), and I think my clients appreciate that it doesn’t make a racket, and is less stinky than the traditional gas powered hedger. These are perfect for grasses like Miscanthus – tie your grass into a bundle and zip through the foliage in seconds with this bad boy. Serrated Japanese sickle. 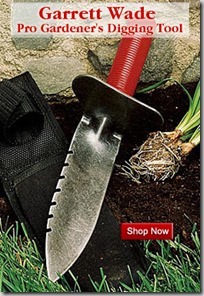 A sickle is a traditional harvesting tool which has a handle attached to a curved, serrated blade. To prune a grass, hold the foliage taut with one hand and use the other hand to run the sickle’s toothed blade against the base of the plant using a sawing motion. Because you’re already holding each clump of foliage, you can put trimmings into a bag or bucket as you prune, saving time on cleanup. Sickles aren’t as effective on the thicker stems of large ornamental grasses, but are a time-saving solution for small to medium grasses. I like this one from Garrett Wade. 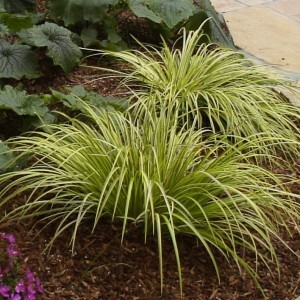 Here are some previous articles I’ve written about pruning different types of ornamental grass. I absolutely love this guide as ornamental grasses are some of my favorite plants ever…along with hostas. They just give the yard and landscape such an exotic appeal…I wish they just made it over the winter. It’s 1 degree right now in Buffalo and they’ll probably not make it this winter because it’s too cold =( But I’ll have to pop back in when it’s time to prune! Brrr!!! Laura, have you tried any panicums? I think those are good to zone 4 and it sounds like you are in 5 or 6? I love them here, though they don’t come out of dormancy until June – they have lovely coloration. Good stuff; when a client pays me to assemble a maintenance sheet, I do something like this. I appreciate that not all grasses are equal, in their growth habits and how to respond / how you must respond. Oh, that’s a great idea, David – to do this for clients! I know that for each site, you may have different intentions for pruning and training, so a custom-written maintenance brochure would be amazing. Pruning can indeed be a rigorous task since different plants have different requirements. So, thank you for this guide! Everyone who gardens, not just beginners, will appreciate this. THANK YOU! you weren’t kidding this is the ultimate guide. I especially loved the tips about using rubber gloves to ‘comb’ out the dead parts. Very clever! I have a bunch of relatively new (9 months) Juncas plants that got much bigger than expected and now flop out from the center to the ground rather than standing upright. It’s quite unsightly, but if I can’t prune them, is there anything else I can do to try to tame them? Give them time. If they are sited correctly with enough sun and decent soil, this is just an awkward teen phase. 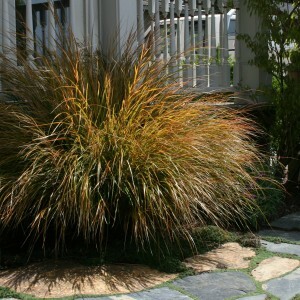 Can I divide my large ornamental grasses? Not sure what they are. They grow to 4 or 5 feet or more. They are now 8 or more years old and do go dormant in the winter here in Humboldt. They are a good 2 1/2 to 3 feet in diameter at the base. That’s probably Miscanthus. Divide away! They’ll survive a bomb. 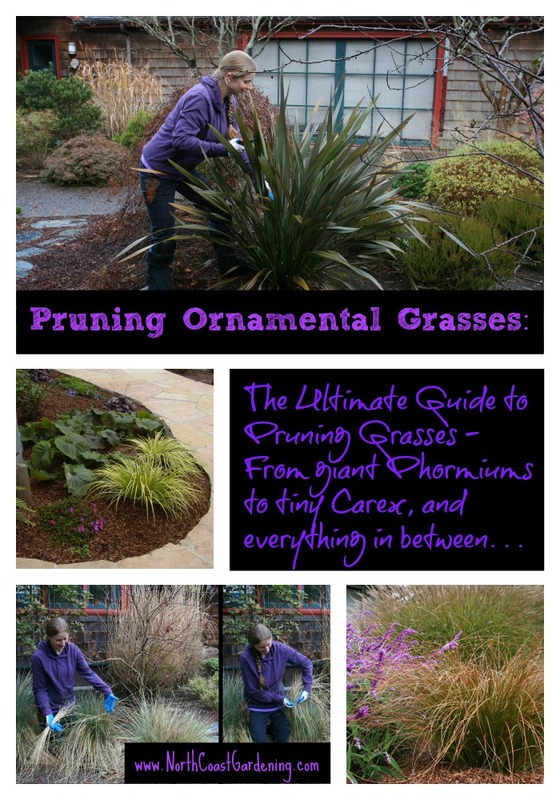 Great guide on pruning grasses. My biggest headache is dividing them. Ugggh. With over 50 large grasses to keep up with each year it’s easy to loose control and let them get to big. Ill definitley be using this article as a reference.